For those of you who read this blog regularly you may have noticed that there is rarely a week where everything goes as planned. This week was of course no different. This week I wasn’t supposed to be designing a Sunday supper. We have a rhubarb cobbler on our menu and since rhubarb is a late spring/early summer fruit, it is time to get it off the menu. However, it is a lovely light summery dessert so at the end of the season we bought two cases which was as much rhubarb as we thought we could process and sell before it went bad. Since, this made a finite amount of compote, it was clearly time for my boss to start working on something to replace it. Therefore, this week she came up with a strawberry cheesecake dish that she wanted to use for Sunday supper as a dry run. She wanted to make my life as simple as possible, so she made all of the components the day before and the only thing I was supposed to have to do was make one more batch of the cheesecakes because we didn’t have enough molds to do them all at once. When I walked in for work two hours before this dessert needed to be done, I was told that instead of doing the normal 24 special dinners, the sous chef wanted to make 30 because we had had a very busy Saturday night, and we were low on a lot of our regular menu items. This would mean making two batches of cheesecake for which I had neither the time or enough ricotta. So, I changed things… a lot. 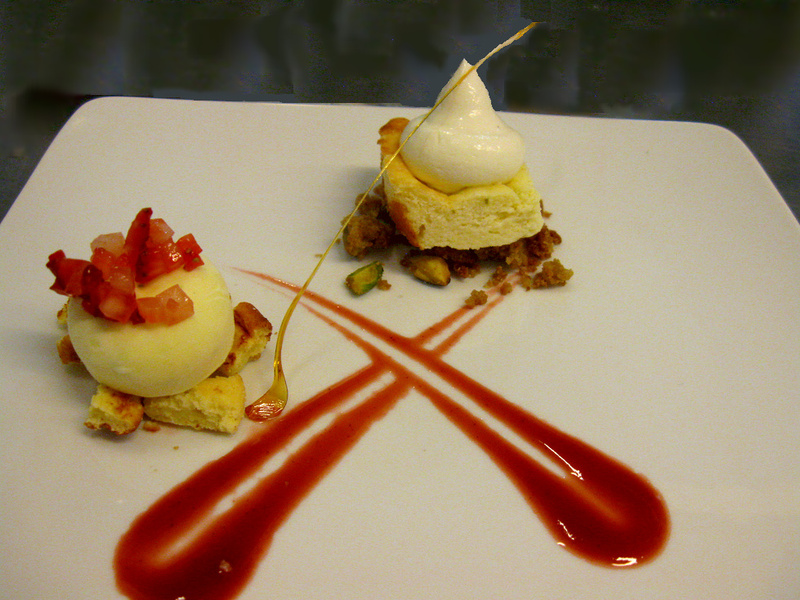 The dessert that she had planned looked almost nothing like this but had similar flavors and concept. The square piece at the back with the cone on top is what is left of the cheesecake. I baked another batch and then cut them each twice with a square cutter. This sits on top of a pistachio crumble which was part of the original design though my boss had it on top of her cheesecake. I topped this with a piped cone of no bake cream cheese cheese cake ( blended cream cheese, sugar, a little heavy cream and some lemon juice) because I was worried there wasn’t enough cheesecake after I cut them down so far. The other section of the dessert is buttons of key lime ice cream sitting on the scraps of the cheesecakes that I had cut and then put in the dehydrator for a few hours. The dried cheesecake was crispy on the outside and still a little creamy on the inside. This is topped with some cubes of fresh strawberries. The plate is finished with a spear of pulled sugar and a sauce made of pureed strawberries and Thai basil. After all that scrambling to have 30 plates, we only ended up selling 17 of the tasting menus; but I think that the plate turned out looking nice and that it was not too similar to a generic New York Style Cheesecake with Strawberry Topping. The reinvention or deconstruction of classic dishes is a time honored pastime for chefs; pastry people are no exception. Dishes that have nostalgic or personal histories — like Peach Melba and Smores — are especially fun to play with in this way. I like to read pretty much any cookbook I can get my hands on, especially those by pastry chefs at innovative places. One of the dishes that often appears in such books, but that has always seemed strange to me, are attempts to deconstruct America’s favorite sandwich: peanut butter and jelly. This strikes me as strange for a couple of reasons. Sandwiches aren’t necessarily very sweet and so turning them into a dessert without losing their essence is a challenge. Also, while sandwiches can make a very satisfying dinner, they are generally perceived as a quick lunchtime alternative. Therefore, they seem out of context as a dessert in a nice restaurant. So, obviously here was a challenge that I needed to take on. This week we had lots of left over California grapes and some puff-pastry dough. The goal was not to be too literal, so, instead of using peanut butter, I chose to use tahini, a paste of ground sesame seeds used in Asian and Middle Eastern cooking. Tahini has the same nuttiness as peanut butter, but it is lighter and fewer people are allergic to it. I made a tahini mousse with white chocolate as one of its thickeners because i wanted to add some sweetness but keep it light. This got piped in strips in one layer and then I chose to make the “jam” out of green grapes, because they taste a little different and fresher then the red grapes in most grape jam. I cut them in half and cooked them down a little into a chunky compote. These went on the bottom layer between two pieces of puff dough. The puff dough was baked between two sheet trays to keep it from puffing, which makes it crispy and flaky instead of puffy and light. These ingredients were stacked up together and topped with a toasted almond cookie. The cookie was mostly almonds with just enough dough to hold them together. I liked the way it looked like a mosaic and it added more of the nut flavors I was trying to build. 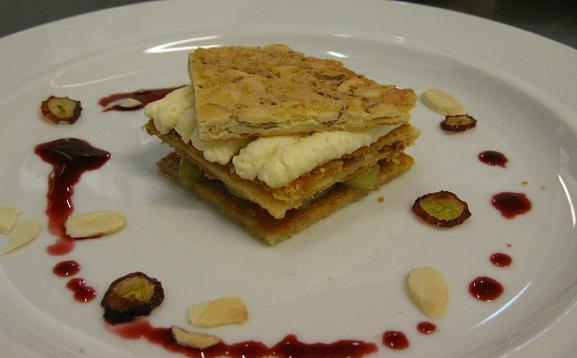 The plate was garnished (perhaps overly so) with toasted almond slices, dehydrated grape rounds and some red grape juice. When I took this finished dessert out to line up, which is the meeting before every meal at which the servers taste specials and go over any managerial issues, the servers were very excited about it. However, someone made the comment ” oh, it tastes exactly like a peanut butter and jelly sandwich.” This comment is what stuck with me when I went back to the kitchen, because it was not really what I wanted to hear. My goal was to make the diner think of peanut butter and jelly but not to actually think they were eating it. My diagnosis was that the dish needed to be sweeter, to push it into the realm of desserts. The easiest way to do this at that point in the process was to brush the puff dough with melted butter, sprinkle it with a big-crystal sugar, and re-bake it briefly. The result was even crispier and added the right amount of sugar to the dish to make it a dessert. So, my peanut butter and jelly experiment is done. This was actually a pretty tasty dish in the end. Though it probably wouldn’t sell well on a regular menu, it was a fun thing to play with for a day.